Looking for hotels near Maquinit Hot Spring? Located in Coron, Happy Camper Hostel has barbecue facilities and garden. The property is around 2.5 miles from Twin Lagoon, 2.7 miles from Kayangan Lake and 2.6 miles from Maquinit Hot Spring. Located along the Coron-Busanga Road, Two Seasons Coron Bayside Hotel offers accommodations with views of the sea, 3.1 mi from Kayangan Lake. Guests can enjoy meals at the in-house restaurant. Bangles Homestay is located in Coron and features a terrace. Popular points of interest around the property include Coron Public Market and Mount Tapyas. Twin Lagoon is 2.9 miles from the property. Hop Hostel offers rooms with free WiFi with limited access in Coron, well set 984 feet from Mount Tapyas. This 2-star hostel offers a shared kitchen and a shared lounge. Featuring a shared lounge, The Yellow House Coron is located in Coron, within 2.6 miles of Twin Lagoon and 2.7 miles of Kayangan Lake. Free WiFi is offered. Featuring a garden and shared lounge, Ezekiel's Transient & Backpackers is located in Coron, 2.5 miles from Twin Lagoon. Located 4.3 mi from Kayangan Lake, Charms Hotel provides accommodations with free WiFi in Coron. Everything about the hotel was great, right down to the hot water shower every morning. Located within the Coron Soleil Garden Resort Holiday Accommodations Complex, Coron Soleil Express Hotel is an annex building at the East side of the property. The room is really comportable but I do like to have a hot water in the morning to drink my coffee. Located in the Palawan city of Coron, MO2 Westown Lagoon Coron offers an in-house restaurant and bar just 5.6 mi from Kayangan Lake. Staff very friendly, informative and welcoming. Rooms lovely and clean and very comfortable bed. The Palladium Hotel has an outdoor swimming pool, garden and terrace in Coron. The 3-star hotel has air-conditioned rooms with a private bathroom and free WiFi. The staff are superb and accomodating. Centrally located in Coron town, One Averee Bay Hotel offers homely and comfortable accommodations with free WiFi access in its public areas. Their breakfast: lots of selections and BIG serving. 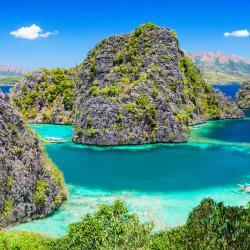 Set 3.7 mi from Kayangan Lake, Vienna Hotel offers rooms with air conditioning in Coron. Around a 5-minute walk from Coron Public Market, the property is also close to Mount Tapyas. The staff was exceptional!!!! The room was large, with a comfortable bed. Offering free WiFi, 4.13 Suites Hotel is located in Coron. Popular points of interest around the property include Coron Public Market and Mount Tapyas. The location was perfect for my husband and I. 2.8 miles from Twin Lagoon, Tapyas View Deck Hotel provides 2-star accommodations in the Coron Town Proper district of Coron. I like the view from the hotel. Located along the Coron-Busanga Road, Two Seasons Coron Bayside Hotel offers accommodations with views of the sea, 3.1 mi from Kayangan Lake. Guests can enjoy meals at the in-house restaurant. Clean, accommodating, staff was awesome as always when in the Philippines. Located in Coron, within 2.7 miles of Twin Lagoon and 2.8 miles of Kayangan Lake, Bluewave Hotel provides accommodations with a garden and a bar, and free WiFi. Excellent hotel. Very good breakfast. Great staff. Accesible place. Featuring panoramic sea views, Coron Gateway Hotel & Suites offers peaceful and modern accommodations with free WiFi access in its public areas. The room was particularly big! Huge bath tub, room and terrace. It was also a very affordable stay. Coron Charming Deluxe Spacious Room with Expansive Mountain View is located in Coron and features an outdoor swimming pool and a garden. The road is too bad uphill . The road is too bad uphill .u pay a lot of money to tricycle to take u there as it is far. U pay also for waiting for u. U pay 200 peso per person as entry fee. There is no water supply in the place.no shower,toilets are available but they use the hot spring salty water. However on the way to the place there is a public water tape. This place is owned by someone who is taking money and providing nothing for visitors. U can find a store inside to buy drinks and water. If u want to visit the place you can take your own needs there before u go. We went here at night time and the place wasn't really jampacked so I could suggest going here at night time to avoid the crowd. Note that the cut-off time of visitors is at 8pm but the place is open until 10pm for those who will be entering within the cut-off. Bring water as the heat from soaking into the hotspring can get really dehydrating. Loved it. Relaxing and soothing. Putty it closes around 7-8pm. So better get there early if you want to enjoy. Few hours without being rushed. Sunset and a few drinks at the local hut shop to soothe away the sunburn from the day trips.